Przevalski's Pinktail is an enigmatic passerine endemic to the Tibetan Plateau. Because of the structure of its horny palette, it was traditionally classified as an emberizid bunting (e.g., Sibley & Ahlquist 1990, MacKinnon & Phillipps 2000) under the name "Pink-tailed Bunting." 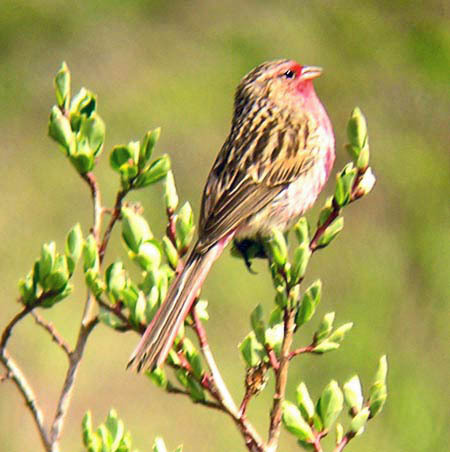 Yet its behavior and habitat, and the pink in the body plumage recall rosefinches, and many birders who have seen it thought it was likely a rosefinch (e.g., Ben King in Groth 2000; Paul Holt, pers. comm. ; Clement et al. 1993). I thought the short snippet of song also recalled rosefinches but Przewalski (1876), who first collected and described it, thought the song was bunting-like. 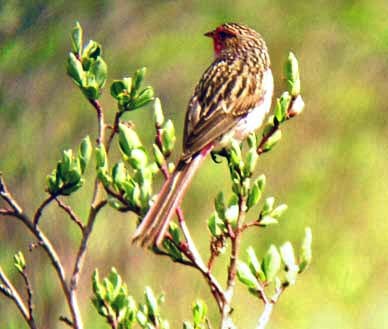 Dickinson (2003) and Collar & Newton 2010 listed it among the rosefinches [Dickinson called it Pink-tailed Rosefinch, Collar & Newton called in Przevalski's Rosefinch] and placed it next to Long-tailed Rosefinch Uragus sibiricus, the species it most recalls. When I was in China in June 2004 on a Sunbird tour with Paul Holt, and took the photos on this page (left and below), we all assumed that the controversy was between a finch and a bunting, and nothing more. None of us had read the biochemical evidence published by Groth (2000). And that evidence is compelling — the bird is neither bunting nor finch, but something unknown. Its lineage goes back deep within the Passeroidea assemblage and, so far, it appears to have no extant close relatives. However, both the Olive Warbler of Mexico and southwest U.S., and the Prunellidae (accentors) are evolved long ago in the base of this lineage. Groth (2000) concludes his paper this way: "I agree with Domaniewski (1918) and Wolters (1979) that Urocynchramus belongs in its own family, the Urocynchramidae." The old papers cited are in German but apparently this is not a new idea. Rather, it now has strong biochemical support. Strangely, Dickinson (2003) cites the Groth paper in footnotes but does not reveal or discuss the findings! A more recent study (Päckert et al. 2016) confirmed its status as a separate lineage at the base of the Passeroidea, and considered it sister to the Ploceidae (weavers and sparrows). They used the name Przevalski's Finch. Yet it is not a finch nor a bunting — it is something enitirely different. The 2016 update of the Clements' world checklist settled on the English name Przevalski's Pinktail — and I now adopted that here. Przevalski's Pinktail is a resident of alpine scrub at high elevations on the Tibetan Plateau of west-central China. We found a pair along the top of the hillside (shown in the habitat photo, right), sitting atop the short shrubs with the male singing for short periods. The pair would then fly on to another dwarf willow for a bit of song, and a bit of looking around. This is at an elevation of over 10,000' (above 3050m). Clement (1993) lists its elevational range as 3050-5000m where it occurs "mainly in pairs or singly, but outside the breeding season small flocks of five to ten occur." My interest in this taxon was awakened by the publication of an oscine passerine supertree by Jønsson & Fjeldså (2006). They reviewed 97 recent studies of passerine relationships that were based on DNA evidence, assessed the strength of the evidence, and constructed a cladogram of relationships based on the evidence to date. I was shocked to find that this bird was in its own Passeroidea clade — in other words, the evidence to date suggests it arose in a difference lineage than any other of the passerines. They also note that this taxonomic position has not been thoroughly researched or well sampled, and does not yet have high Bayesian or bootstrap support. So this is a question that deserves further analysis. Groth (2000) points out some anomalies morphologically. Most important is the fact that this bird has ten primaries; the outermost primary is half the length of the 9th primary, but still is a usable primary. All other fringillids and emberizids have only 9 primaries (the 10th is vestigial). While the evolution of the nine-primaried wing is a derived condition, no other bird in the nine-primaried group has undergone a character reversal to a ten-primaried state. This alone suggests something is quite different about this bird. Another oddity is the pink in the tail (which can be seen in my photo, left). If this bird were a rosefinch, it would differ from all rosefinches on this character. Now it looks like it might be related to weavers (Päckert et al. 2016). Obviously, there is much more to learn about this bird. Its biology and breeding ecology are essentially unknown. Clement et al. (1993) refer to it as a "shy and little-known species from central China." I feel quite fortunate at having photographed this interesting little bird. Photos: The Przevalski's Pinktail Urocynchramus pylzowi was photographed near Heimaihe, above Qinghai Lake, Qinghai, China, on 19 June 2004. Uncredited photos © Don Roberson; all rights reserved. Bibliographic note: There is no "family book" for this recently created family; it is superficially covered as a fringillid (but acknowledging in the text that it is not really in that family) in Collar & Newton (2010). Clement, P., A. Harris, and J. Davis. 1993. Finches and Sparrows: an Identification Guide. Princeton Univ. Press, Princeton, N.J.
Collar, N.J., and I. Newton. 2010. Family Fringillidae (Finches), pp. 440 –617 in Handbook of the Birds of the World (del Hoyo, J., A. Elliott & D.A. Christie, eds). Vol. 15. Lynx Edicions, Barcelona, Spain. Groth, J.G. 2000. Molecular evidence for the systematic position of Urocynchramus pylzowi. Auk 117: 787-791. Päckert, M., J. Martens, Y.-H. Sun, and P. Strutzenberger. 2016. The phylogenetic relationships of Przevalski's Finch Urocynchramus pylzowi, the most ancient Tibetan endemic passerine known to date, Ibis 158: 530-540. Przewalski, N.M. 1876. Mongoliia i stran Tangutuv, vol. 2. Russkago Obva, St. Petersburg, Russia.